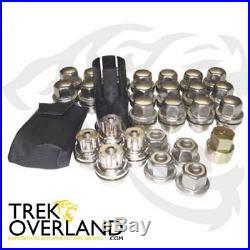 Land Rover Discovery 2 OEM Locking Wheel Nut & Key Kit - STC50080. Full set of wheel nuts. Protect your valuable wheels and tyres from theft! Kit contains - 4 x locking nuts; 4 x spare caps; 18 x normal nuts (inc caps); 1 x key & 1 x remover tool. Carriage costs are for UK mainland ONLY. Highlands and Islands are not included within the UK Mainland. (Post codes IV, HS, KA27-28, KW, PA20-49, PA60-78, PH17-26, PH30-44, PH49-50, ZE PO30, PO34-40, IM, BT & Channel Islands). However we will not accept claims of damage in transit or if products not meeting their description outside this period. If your product has been damaged in transit it must be reported within 24 hours of receipt. After this time, we may not accept responsibility. How do I arrange a return? Tiger Parts UK Lund Court Farm Nawton York North Yorkshire YO62 7TZ. TigerPartsUK is a department of Trek Overland. Listing and template services provided by inkFrog Open. The item "Land Rover Discovery 2 OEM Locking Wheel Nut & Key Kit STC50080" is in sale since Tuesday, November 28, 2017. This item is in the category "Vehicle Parts & Accessories\Car Parts\Other Car Parts". The seller is "tiger_parts" and is located in York.